Germans try to enlarge Sedan pocket. British withdraw from Louvain, west of Brussels as troops of the German 6th Army break through the Allied Dyle line in Belgium. Belgian government leaves Brussels for Ostend. The Red Army occupies Latvia and Estonia. Tens of thousands of “hostile’ natives and their families are rounded up and deported to NKVD prison camps around the Soviet Union. Churchill urges Mussolini not to become involved in the war. 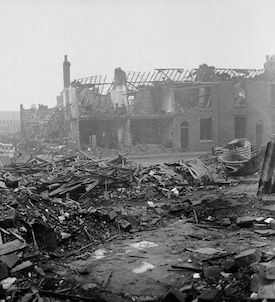 With a raid by 111 German aircraft on Birmingham, the Night Blitz campaign against England comes to an end. Most Luftwaffe bomber formations in France and Belgium are being transferred to airfields in eastern Germany and occupied Poland. The RAF launch a night raid on Cologne. The Afrika Korps counter-attack against the British and retake Sollum and Capuzzo, although the Halfaya Pass remains in British hands. Berlin orders Rommel to leave Tobruk to the Italians and to concentrate the Afrika Korps near the Egyptian border. The Italian forces under the Duke of Aosta surrender to British forces at Amba Alagi in Abyssinia. Last British reinforcements arrive in Crete. Kerch is captured by German troops, forcing the Russians to evacuate their troops across the straits in extremely difficult conditions and under heavy fire. For five days, Russian ships shuttle back and forth, finally pulling out 86,000 men, including 23,000 wounded. The Warsaw ghetto is finally cleared of Jews by the German police and security units. Wing Commander Guy Gibson leads the ‘Dambusters’ night attack by 19 aircraft against the Ruhr dams, during which ‘bouncing bombs’ breach the Mohne and Eder Dams causing severe flooding and loss of civilian life in the Ruhr valley below them, but doing little damage to the industrial installations. Gibson is later awarded the Victoria Cross. Aircraft of RAF Coastal Command sink 5 U-boats off the Norwegian coast. The first Jews from Hungary arrive at Auschwitz. Eichmann arrives to personally oversee and speed up the extermination process. The 17th Indian Division counter-attacks South of Imphal. British troops land on Alderney, taking 3,200 Germans prisoner. U-234 surrenders at Portsmouth, New Hampshire, USA. On 16th April 1945 she had departed Norway and was enroute to Japan with an extremely important cargo, which included technical drawings, an Me-262 jet fighter in crates, 550 kg of U-238 uranium ore for atom bomb development, several high ranking German technological experts, and 2 Japanese officers. When Kptlt. Fehler heard of the cease-fire orders on 4 May 1945, he decides to surrender to the Americans, rather than the Canadians, being in a relatively equal position to do either. Still at war with the US, the Japanese officers take their own lives rather than surrender. Heavy fighting continues on Okinawa, as the U.S. 77th Division takes ‘Chocolate Drop Hill’.